Qualifications Required: No qualification required, customer service focused mindset is essential. Resale Opportunity: Can be resold at market value at any time. Marketing Support: Will provide assistance in setting up shopping centre kiosks, distribution of flyers, social media and online marketing tools etc. 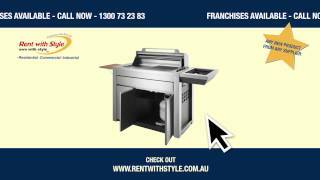 The company is an Australia-wide rental based company providing washing machines, fridges, computers, laptops, freezers, television, sound system, home theatre, mobile phones, furniture, outdoor setting etc @ affordable prices and we deal with all leading brands. The consumers need not pay anything at the beginning and at the end of the agreement. Our consumer base includes pensioners, single parents, self-employed, casual workers, small businesses, commercial premises and any person above the age of 18. This is a shout out to potential business owners who would love to associate themselves with a nationwide brand. Contact Rent with Style now to find out more!! !